In 1889, Mesny made a brief survey of the countryside around Hefei, the modern capital of Anhui province, for the Shanghai Famine Relief Committee. This had been set up to raise and distribute funds during a prolonged drought in eastern China, which had hit central and northern Anhui particularly hard. Mesny’s task – undertaken voluntarily – was to see that money and grain were reaching the people who needed them. Famine played havoc through eastern China right through the late nineteenth century and into the twentieth, not helped by the era’s breakdown in law and order. Pearl Buck based her classic novel of Chinese peasant life, The Good Earth, on her own experiences in Anhui during the 1920s. Mesny’s route from Wuhu (“Chuang Ye Nan Lu” on the lower right side of the map), northwest past Chao Lake to Hefei, and circuiting back to Wuhu. 20 Jan, 1889: Took passage in the river steamer Lai Wo, of the Red Funnel Line, departing Shanghai for Wuhu, stopping at various places along the Yangzi en route. 21 Jan: Arrives Wuhu. Transfered to hulk Madras belonging to Jardine Matheson. Wuhu recently grown in importance thanks to becoming a port for the rice trade. 23 Jan: departs Wuhu in a junk down Yangzi to Yuxi Kou (裕溪囗), at the mouth of a small river; head north up river, then bear ssw; stopped for the night at small market town called Yongjia Zhen, about 50 li from Wuhu. 24 Jan: Continue along river, within high banks to prevent flooding of low-lying rice producing area; pass customs barrier at San Xia He; sight mountains ahead called Shizi Shan by boatmen, but unmarked on maps. Pass market town of Yuncao Zhen (運漕鎮), busy place with lijin office; large boats; women and children all wearing red and feet unbound. More small towns; moving more or less north, river very wiggly though and course east-west via bends. Approaching mountain range, runs e-w, and is called the Chin chieu Shan. Slack surrent but moving into headwind, so slow going. Arrive late at Dongguan (東關), small town; hills here defended by Taipings durign their rebellion. 25 Jan: Guishan Lou, rocky bluff topped by a pagoda. Snow. And onwards, more of same until Chao Xian (巢縣) city; watermark on city wall six feet up, though told that river rarely floods into city, the gates being locked shut during floods; large place but mostly ruins from rebellion, including pagoda and yamen, the magistrate living in private house. Rice at $1.40 per picul of 160 catties, equal to $1.70 Mexican. Crop last year was fifty percent of a good year. “There is some distress”. 26 Jan: Pass pontoon at south gate, removed to let craft through. Small steamer stationed here by Li Hongzhang “for the use of his relatives and friends”. Pass many seasonally dry creeks, navigable in summer, into Chao Hu, a respectably-sized lake, many vessels and wildfowl; distant pagoda in lake just visible; people sailing around in large wooden tubs. Town called Zhong Miao Zhen (忠廟鎮). Old pagoda on island. Onwards. Anchor off Xi Kou, “the entrance to Luzhou Fu River” but water very shallow; buffalo hauling vessels over mud bar into river. 27 Jan: More tubs instead of boats, ferrying rice and people through shallow waters to lake shore, about a mile distant. Mesny uses them too; tubmen pole and when water is too shallow even for this gets out and pushes the tub onwards. He then carries passengers on his back through soft mud to dry land. Charges 100 cash plus 20 cash “wine money”. Embarks a small covered boat, just large enough that they “may sit or lay down in her and eat when hungry”. Gives lift to three others, “thus we are six besides two boatmen and child”. Xi Kou is small military post on Lu River. Pass revenue station called San Ls’a? He. Onwards, more low water, towed by man along bank. Eventually land after dark and walk to city [Hefei], entering through Little East Gate, put up at a “large but comfortable inn not far from Kao Peng, or ??? Hall. This city is large and is the seat of the He Fei Hsien 合肥縣 chief county in Lu Chou Fu Prefecture 盧州府”. In the middle of a fine fertile plain the city was previously surrounded wet, navigable ditch with a canal through the city; all dry now; very few trees; Mesny speculates that is probably the lack of them that has caused the drought. His advice: plant trees, dredge river to make it navigable and ensure water flow, build reservoirs in the most elevated positions, canals fitted with locks. 2 Feb: Ink frozen with cold. Officials send chair for Mesny and ponies for his servants, plus groom and baggage carriers. Two “Yamennites” [court officers] also accompany them. March through city, snowing, streets slippery, coolies fall; to temple and nearby canal; over dry canal. There are three water gates in city wall, blocked by grilles to prevent boats sneaking in, but no water anyway at present. Out east gate and into suburbs. Coolies stop to buy tobacco although they are dressed in filthy rags. Roaf paved but badly cut up, with a public well in the middle of it; very few proper houses, more like “miserable huts”. Exit over another dry canal and into surrounding countryside. This year’s crops doing OK, fields full of healthy barley thanks to winter rain and snow. Laments lack of reservoirs for irrigation, given the desire to grow rice, not winter cereals. Bad roads, snowy mountain ridge, small villages, houses with mud walls and thatched roofs tied down with straw rope, lack of trees. Small market town of Dianpu, very poor with a third of the town starving after rice crops failed the previous year. Li Hongzhang is from here “and several other persons of note also hail from this town, all in the counrty of Ho Fei Hsien”. 3 Feb: Onwards, more snow. Court officers return to Hefei and Mesny gives them wine money and his calling card for the Magsitrate. 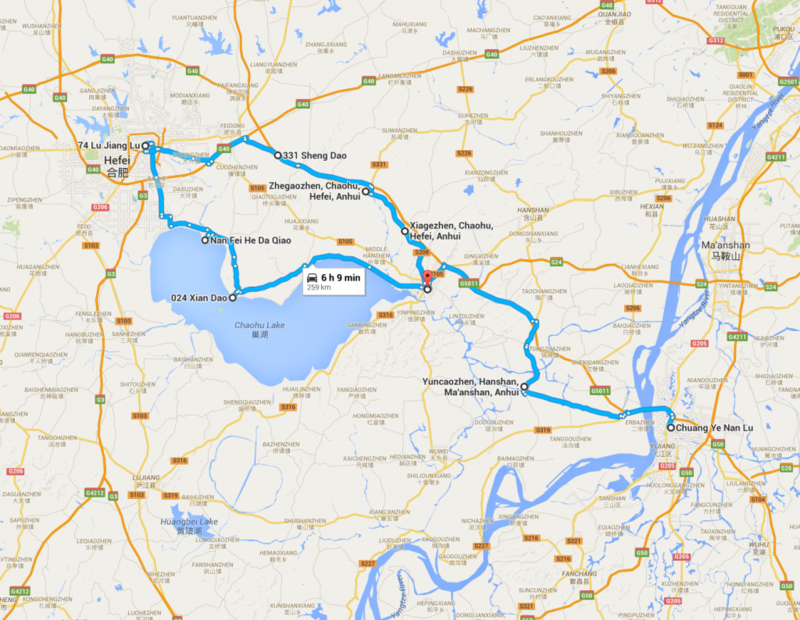 Reach Chao Hsiang Pu, home of a “distinguished Song official” – perhaps Lord Bao? – and ruins of his former home. A descendent of the great man chats to Mesny and tells him that his Chinese name, Mai (麥) is not on the official lists of Chinese family names. Crosses into neighbouring Lu Chou Fu Prefecture and reflects that “taken on the whole, Hefei is a poor county despite its very fine plain and the fact that tens of thousands of its sons served during the late civil war at a good pay, many of them rising to rank and opulence and many of them are still holding lucrative posts in various parts of the Empire. The lack of trees, good roads, canals must always be a great drawback to the place as it has no fuel but straw, and its population being entirely devoted to agriculture are reduced to starvation whenever crops fail. They are thus sometimes forced to revolt to obtain food”. Sees a few stunted pines. Stops at village called Dong Shan Kou, another place needing famine relief, as is Pingyang Pu hamlet, many locals frost-bitten faces. On to Che Kao Chen (柘皋鎮), large busy place with shops and small industry; magistrate and military official, people using wooden cradles; poor crops and only straw for fuel. On navigable river, with traffic to Chao Xian, including junks in summer. Town lively with New Year celebrations. Foreign goods for sale. Onwards to Xia Ge Zhen (下閣鎮), no relief sent or more needed, short crops; Wanjia Shan (萬家山), red conglomerate boulders, again complains about lack of trees [doesn’t occur to Mesny that they might all have been burnt for fuel or eaten, if population is starving]. Stops in small Wanjia village, short of crops but he sees some coal, which he believes should be mined as an obvious fuel source given the lack of alternatives. People “well behaved” but ignorant and poor, animals and families typically under one roof. Almost no furniture; people sleep on beaten earth floors. 4 Feb: On again, cross slopes and ridges. Early start and soon amongst market gardens on the outskirts of his starting point, Chao Xian (巢縣). Chao Xian pagoda comes into view. Through small villages, yellow earth fields with water buffalo and magpies [so must be some trees at last], sight Chao Hu, mountains south of city covered with snow; city soon in sight, enter north gate, walls and pagoda in ruinous state, paifang; yamen also in ruins so magistrate is housed elsewhere, very few houses on this side of the river; many junks and boats on river, covered in banners and flags [New Year]. Back where they were on Jan 26, having looped via Lu Chou city. Embark on a Hubei junk, furnished for Mesny by the magistrate at a cost of only 3000 cash. Pays off the colies and sends them home with a present for themselves, his card and compliments for the officals at Luzhou; chairs and ponies sent back too.